I came across this small find through a blog that I was arbitrarily and rather mindlessly browsing through. Nonetheless, I really do appreciate this witty product. Rare Purple Rain from the Vesulitanova mountains located in the Antarctic region. Not even Prince can handle this find. 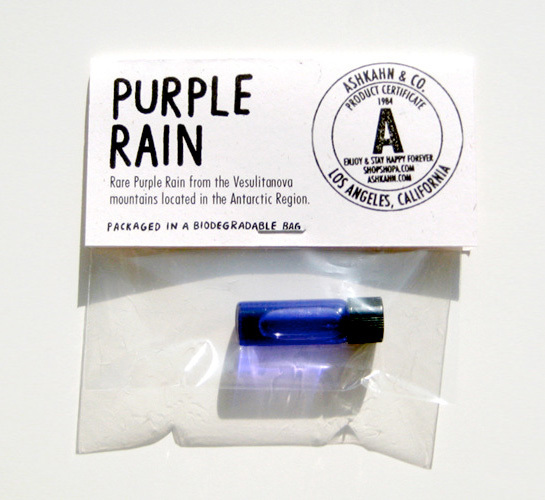 Each limited Purple Rain is hand packaged in a glass vial to last a lifetime. A little extra information: This commercial product was created by artist and designer Ashkahn Shahparnia. His studio, Ashkahn Studio and Co. works on a variety of projects in print making, music packaging design, apparel design and product design, all of which are visually exciting and conceptual.